Oh geez! Now what? Bumped? No…I have my boarding pass already. I’m only called ‘Timothy’ when I’m at the doctor”s office. Wait a minute…did I push some “surrender-my-seat” option at the self check-in kiosk? Oh ‘Timothy’, just go see what they want for crying out loud…. OK Tim(othy). Go sit back down…try to curtail the happy feet dancing along the way. Tim(othy)! Come on man…gather your stuff – hurry up. “Wait for me, I”m coming”. Originally I was supposed to be boarding with Group 3 (as FS once said, several years ago, when about getting on a really cheap, cheap, cheap flight to NYC to see his favorite sister, “am I in the cargo bay with the farms animals?”). Y’all know that feeling being in “Group 3 or greater, right? The pilot greeted me. Wait…what, the pilot? OK, sir. Let me assume the pre-flight checklist is done, you’ve walked around the plane and touched a few movable airplane parts to be sure, and now you’re just small-talking with the likes of us. So I asked him about the rain on the east coast. With confidence he said it would be moved out of DC by the time we arrive. I was excited and already digging for my stowed camera. I had a window seat! You know how it is when boarding for coach seating (usually in group 3 or greater for me anyway), there are times when the already-boarded first class passengers stare at you with this seemingly annoyed look about them? It is that look that gives you the feeling they consider coach passengers to be “second class”…yeah? Well that’s not going to be me, no siree. I smiled politely and cordially at every coach passenger coming on the plane…and not in a “nana, nana, boo, boo I’m in first class” smirk-smile sort of way either I might add. Now hang on. Who is this very timid looking, older-than-me couple stopping at my my row? Folks…I realize the ‘First Class’ seats are wide, but I also know there will not be room for three of us in these two seats. “Nooooooo” (actually it was another word) went racing through my head…. “Oh I think not ma’am. I’m in Seat 4A”, as I reached for my boarding pass to prove it. “That’s ok…I don’t know why they the seating starts with row 3”, stated the gentleman. 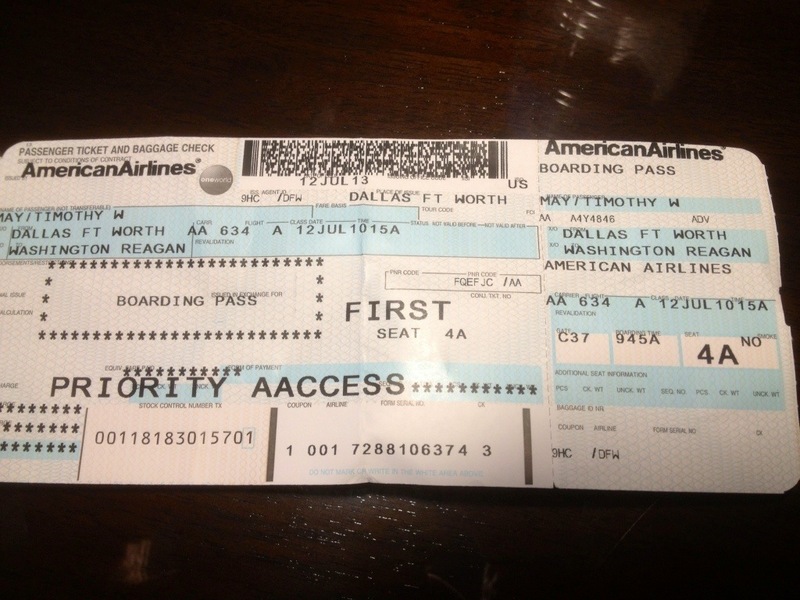 Yes, I am a ‘First Class’ rookie…. Finally, we’re fastened in and the cabin doors are closed. Up, up and away. First Class! Ahhh yes! I had no idea the flight attendant would bring so many beverages. Within 10 minutes of takeoff, the guy next to me was asleep. Oh boy, I should have peed before getting on this 3 hour flight! “Would you like a red or white wine today Mr. May?” What do you mean…I get wine with my lunch? I don’t know if I have ever had wine with my lunch…ever. And, for crying out loud, I had my choice of wines! (Hmmm, maybe I should have asked for a glass of each). I then started looking for a place to set my drinks, iPhone, and iPad. OK now Tim(othy), you have a college eduction. 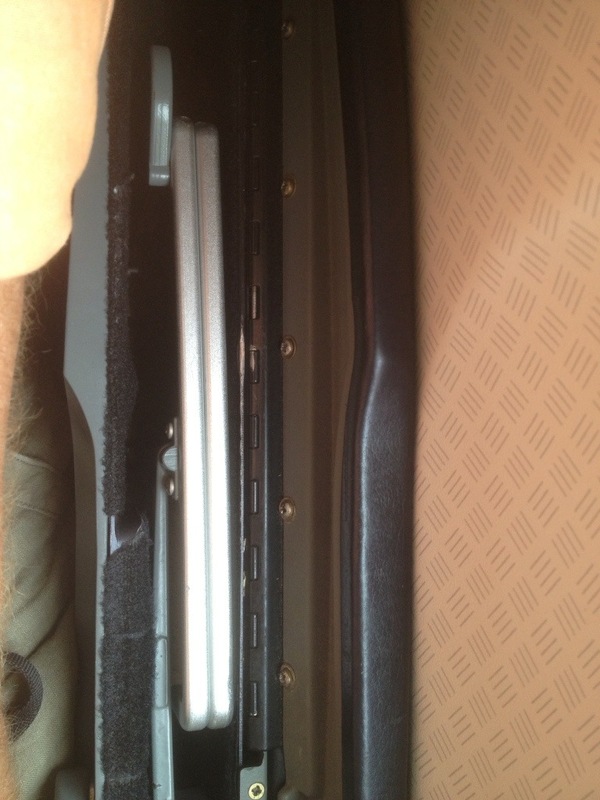 You can find the tray table if you just stop and assess all the possible and logical locations. Look at the lady across the aisle. Where did she get hers? Oh, they have it all folded up in the arm rest? So how does this work? Oh and by the way, that little slide-out mobile phone-sized tray on the center console – pregnant idea you airline designer people! Hot towels – now why in the world are they bringing me these? Ohhhh! Hey, these feel so good on my face. I wonder if they’d mind if I shaved now. No Tim(othy), holster your redneck tendency…come on now, think ‘First Class’ you knucklehead! Here comes lunch. What? 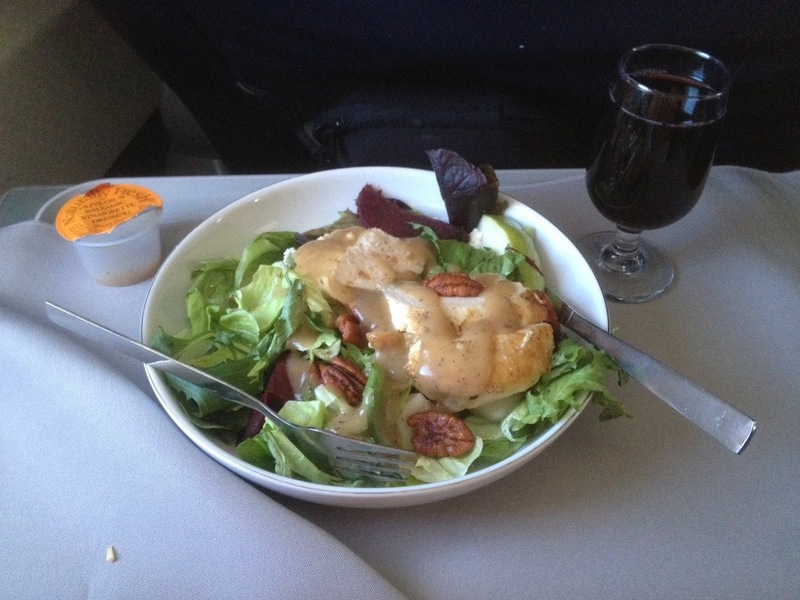 I’m eating off real China dinnerware…at 32,000 feet? Hey now! There are beets in my salad…and apples and walnuts too. These are foreign ingredients for the salads I usually eat. Olive oil balsamic vinaigrette – wow. This sure isn’t my typical Ranch dressing over Iceberg lettuce. Lunch was snarfed. An after-lunch beverage is offered (and gladly accepted). So is a mint. ‘First Class’ passengers apparently cannot have bad breath or something. I wonder if the ‘First Class’ lavatory is equally “First Class”? Well damn if the guy next to me is not back to sleep. Bejesus man, these seats are comfortable and all, but they are not a bed mattress. What’s with this guy? Why isn’t he awake and enjoying all this ‘First Class’ treatment? Hey you, my fellow ‘First Class’ passenger, don’t you know I still gotta pee? Wait just a minute. No way! 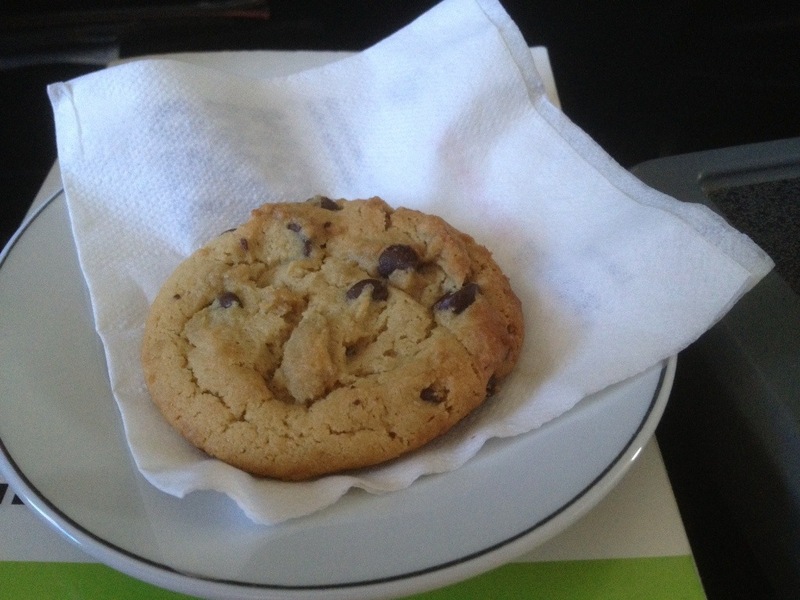 Is that the close-your-eyes-and-inhale-long-and-slow heavenly smell of cookies baking filtering through ‘First Class’…at 32,000 ft…on a damn Air-o-plane! It is! “Ma’am, since this gentlemen is asleep, I will gladly hold his cookie until he awakens” (yeah right). A guy could get used to this ‘First Class’ kind of travel p-r-e-t-t-y easy.